Plans for the New Picture House, 'The Citizen', 28 June 1930. The opening of The New Picture House (NPH) marked a new era for cinemagoers in St Andrews. As the newspaper reports emphasised, the NPH incorporated ‘the latest and best in cinema architecture and furnishings’. Modern standardised equipment (‘the pay box equipped with the latest automatic ticket and change-giving machines’) was combined with traditional architecture (the arched portico was ‘entirely in keeping with the mediaeval aspect of North Street’). Luxurious, ‘oriental’ features appeared alongside distinct local aesthetics (for example, the oil painted panels depicting scenes from St Andrews by local artist Ada Walker). At a moment of transition in cinema history – a shift from the ‘silent’ to sound era – the NPH positioned itself at the forefront of new exhibition practices that would seek to attract a more affluent and middle class audience. The reports also highlighted the comfort of this new cinema. The auditorium, with its curved floor and removable screen (‘leaving an ample stage for plays’) could seat 680, with an additional 243 on the balconies. The Citizen suggested that more seating could have been included, but in its quest for comfort the cinema included an ‘unusually generous’ space between the rows. Cleanliness was similarly prioritised – the ‘powerful and up-to-date electric vacuum cleaning plant’ – while reports sought to counteract the perception that cinemagoing was an unedifying experience in the dark by including ‘vita glass’ windows. These windows, it was claimed, ensured that patrons would receive ‘the purifying and germ-destroying ultra violent rays of the sun’ and would provide great benefit to the ‘health of patrons’. On opening the cinema, Councilor A. McDonald Peddie, the chairman of the NPH, explained that it had been the aim of the Directors to provide ‘the public of St Andrews and the district with a modern, comfortable, well-ventilated, and well-equipped theatre.’ The cinema also offered international luxury and glamour. A Café and Smoking Lounge, which included an illuminated electric fountain (‘the first of its kind in Scotland’), somewhat ambitiously claimed to bring an ‘almost oriental air of luxury’ to St Andrews. Alongside this, reports celebrated the distinctive local identity of the cinema. The project was overseen by the local architects, Gillespie and Scott and when their plans were first announced and passed by the Works Committee at a town council meeting in June 1930, The Citizen deemed it a ‘matter for congratulation’ that it was a local company and not ‘outside agencies’ that had obtained this site. The first film to play at the NPH was the musical comedy No! No! Nanette (1930). 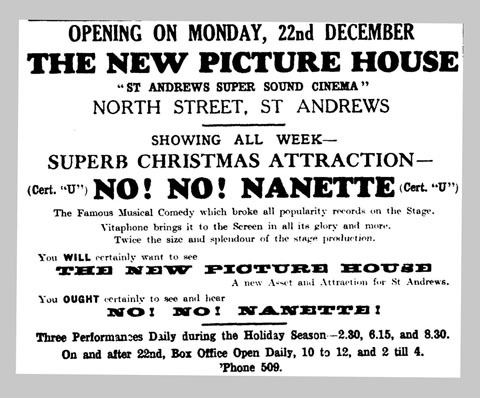 Advertisements promoted not only the film but also this new building, stating ‘You will certainly want to see The New Picture House, a new asset and attraction for St Andrews.’ The NPH was described as ‘St Andrews Super Sound Cinema.’ Such claims evidently positioned the NPH in competition with The Cinema House, which had operated in the town since 1913. 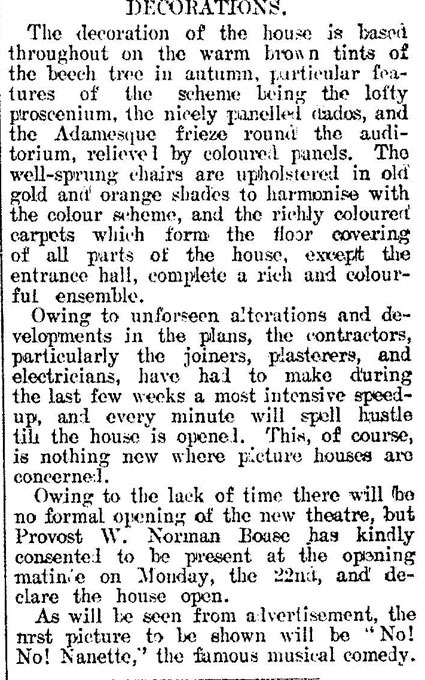 The Cinema House had completed a major renovation and extension just a few months earlier in March 1930. This renovation allowed for an extra 250 patrons, a ‘new ventilating system’ and, most significantly, the introduction of the Western Electric sound system. 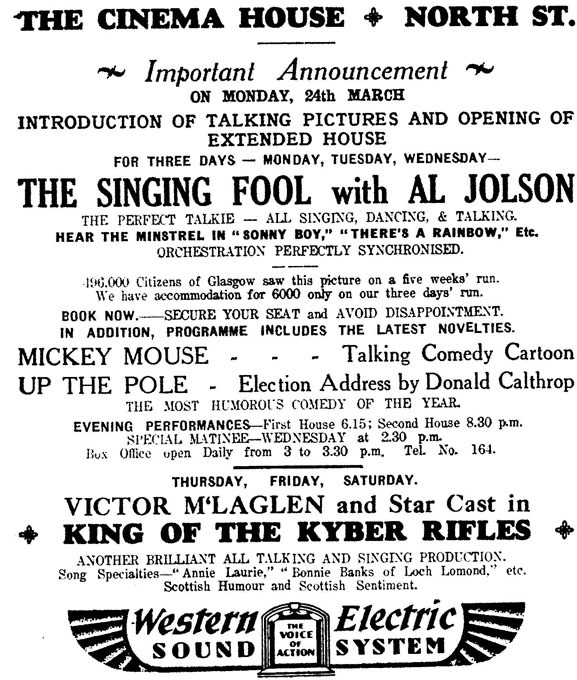 The first sound film to play at The Cinema House was Al Jolson’s The Singing Fool in March 1930. 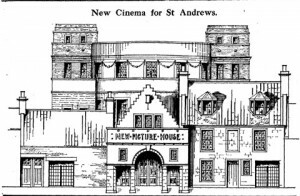 By the end of the year, St Andrews had two recently developed cinema buildings, both offering the latest sound technology. These two cinemas would operate alongside each other for almost fifty years, until the sudden closure of The Cinema House in December 1979.